If you go there on Saturday or Sunday, expect a lot of people, but somehow it never feels overcrowded like Oxford Street or Leicester Square. There’s a lot of creative energy in South Bank, and at the same time the River Thames gives it a very relaxing vibe. This self-guided walking tour takes you from west to east: from London Eye to Shakespeare’s Globe. 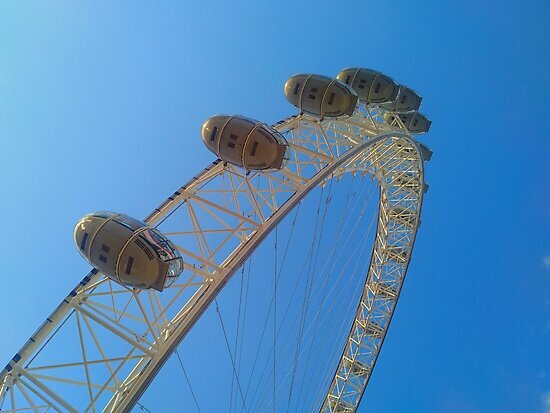 This giant, iconic Ferris wheel is a familiar symbol of London. Launched in 2000, it has been a seriously popular attraction ever since. When you ride it you can see up to 40 km away. Across the Thames river you’ll see more London icons: Big Ben and the Houses of Parliament. If you’re into photography or learning to use a camera, you’ll notice this part of London offers some amazing opportunities to practice your photography skills. Unsurprisingly, there are quite a few guided photography tours of South Bank. South Bank, and especially this part of it, is one of the best places in London for street performers. Musicians, dancers and circus acts give excellent, professional shows by the rivet every day of the week. When you reach Hungerford Bridge, go up the ramp and you’ll see Southbank Centre to your right. This cultural complex has several concert halls, a contemporary art gallery (The Hayward Gallery), a poetry library and a lot of events going on in the public spaces of the building. Pick up a monthly magazine for info on everything that’s going on at Southbank Centre. They run festivals, talks, free shows in the foyer and lots more. The building was built in the brutalist style, an architectural style that dominates this area. You’ll typically see many spots of colour against grey, raw concrete around here. At the back of Southbank Centre there’s a food market every Friday, Saturday and Sunday. To find it, go around the building, past the Nelson Mandela statue and down the stairs. Don’t miss the singing lift in Southbank Centre! Look for the glass lift. Take it to go up to level 5, where you can have great views of the Thames from the terrace. When you leave Southbank Centre, go down the yellow stairs and on your right you’ll see a lot of graffiti and some skaters and perhaps a BMXer too. There’s more to this than meets the eye. This skate park has some historical significance, as it dates back to the 1970s and is said to be the oldest recognised skate park that still exists today. The place was under threat from developers who wanted to use the space for retail. This has led to protest from the skateboard community and many supporters. A charity called Long Live Southbank has been making great progress towards saving and restoring the undercroft. For now, the skaters and BMXers are still there and are fun to watch. Keep walking with the river to your left until you reach Waterloo Bridge. Right underneath the bridge is the South Bank Book Market. curated An outdoor second hand book market is not a common thing in London, but this one seems to be open all the time, even on cold rainy days. If you love books, this is a good place to stop and browse. I’m always surprised at how many people you see around there… who says that books are dying out? Place them in an unexpected location and people will randomly stop and show interest. The British Film Institute aka BFI is to your left right next to the book market. This entrance takes you to the cinemas past the restaurant. But if you’re not about to watch a movie just now, there’s more inside. The BFI mediatheque is a particularly cool thing. Pick a booth, sit down and put the headphones on and use the touchscreen to access 33,000+ TV shows, rare films, documentaries and short clips from the BFI national archive. They’re sorted by age groups and in curated collections by theme. When you leave the mediatheque, go upstairs to the mezzanine gallery. It’s a lovely little gallery that features film-related exhibitions, such as film posters, scripts, costumes and the like. Last time I visited they had an exhibition about the British thriller, with old movie posters and photos from movie sets. Go back down and check out the BFI library to your right. It has books and journals about cinema and its history, mostly in Britain but also worldwide. Everything is openly available and free. As you exit the BFI, the next brutalist building you’ll see is The National Theatre. This is obviously a great place to enjoy some excellent British theatre. Check out what shows are on. The National Theatre also has theatre-related exhibitions. You’ll find these in the Lyttelton Lounge and the Wolfson Gallery and they are free. Last time I visited they had a beautiful display of Theatre posters, showing how they evolved since the 60s. Check their website for the schedule of gallery talks. For some gorgeous views of London and the Thames, go up the The Deck. It’s an events venue on the roof of the theatre. You can go up to the part that’s open to the public and enjoy the views. When you leave the National Theatre, keep walking with the river to your left and take in some more of the wonderful views. When the path bends to the right you’ve reached Gabriel’s Wharf. Look down at the beach and check out the magnificent sand sculptures. These are made by the legendary Beach Captain who’s been making them for nine years now. They are always so amazingly detailed and creative. The sculptures are washed away and the next time you visit you’ll see a different sculpture. Gabriel’s Wharf is a nice mix of independent shops and some restaurants. Old garages were converted into studios and shops and alongside the eateries, they offer a nice place to explore along the South Bank. Right next to Gabriel’s Wharf you’ll see some grass and benches. These are Bernie Spain Gardens, a good spot to chill, with a view to the Thames of course. From the gardens you can see a large industrial red-brick building – that’s OXO Tower Wharf. This is a centre for design, art and crafts. Plenty of design shops occupy this former industrial building, selling fashion, accessories, jewellery, textiles, gadgets and interior design items. It also has two exhibition spaces – gallery@oxo and Bargehouse, with a changing schedule of artistic events. The history of Oxo Tower goes back a long way. It was originally a power station and later became a factory. By the 1970s the wharf was derelict. It was revived by the local community, who set up the Coin Street Community Builders enterprise, refurbished the building and turned it into a design centre. From Oxo Tower, continue walking along the river. You’ll pass by a residential area (yes, people live here!) till you see Blackfriars Bridge. Go through the Blackfriars Bridge Underpass, where there’s a regular spot for street performers and you never know what kind of music you’ll hear. Check out the black and white illustrations on the walls of the underpass. Next, you’ll reach Blackfriars Station and if you look up you can already spot the Tate Modern chimney. One of London’s most famous attractions, Tate Modern is a huge modern and contemporary art gallery, housed in what used to be a power station. It’s part of the Tate group which includes Tate Britain, Tate Liverpool, Tate St Ives and Tate Online. It was opened in 2000 but is already an iconic London institution. Take your time when you visit Tate Modern. You may need to go several times, as there’s a lot to see and the building is massive. Entry is free, except for some temporary exhibitions. The Tate Modern collection includes British art from 1900 onwards, and modern and contemporary art from all over the world. Right next to Tate Modern is the famous Millennium Bridge, with St Paul’s Cathedral on the other side of the river. Our next and final stop in the tour is another famous London institution: Shakespeare’s Globe Theatre. The original theatre was built in 1599. Since then it was burnt down, rebuilt, demolished, reconstructed and opened again in 1997. The current Globe is a replica of the original building, close to its original location (by the way, there are more replicas of this theatre in different places around the world). If you want to experience seeing a show at the Globe, check out what’s on at the theatre. Apart from plays, they also have talks and musical concerts. You can get standing tickets for as little as £5, but you want to hurry as they often sell out. If you’re a Shakespeare fan, you may be interested in a Shakespeare walking tour in London. This is where this self guided tour ends. From The Globe you can reach several underground stations easily (Mansion House, London Bridge, Southwark and St Paul’s). For more self guided tours in London with more urban nature, check out Great Walks around London by Waking Up Wild! The information on South London will have to wait for my next trip, but the app sounds brilliant!